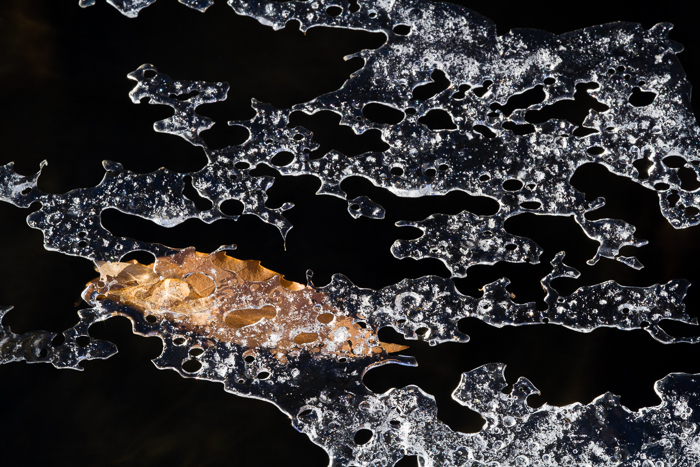 A beech leaf is suspended in a fine lattice of ice over Gory Brook in Rockefeller State Park Preserve, Sleepy Hollow, NY. Canon 7D, 180mm f/3.5L Macro Lens, ISO 100, f/22, 1/8 second. Happy snow day to all my East Coast friends and fans. Earlier this week before all the snow, I took a trip to Rockefeller to photograph ice formations. We'd had a string of cold nights and days, but no snow, so I thought conditions might be ripe for some macro photography of ice on the various streams and puddles. I wasn't disappointed. I had a peaceful and enjoyable (if cold) morning and came back with a slew of keepers from my efforts. I love macro photography in the winter because you can find some really artistic and abstract compositions. I particularly love the ice formations that occur when there are rapidly changing water levels, currents, or melting and refreezing that introduces air bubbles and other interesting patterns. The muted color palette of winter compared to spring, summer, and fall macro photography allows you to really focus on pattern, form, and design. Here are two of my favorites from that morning. I'll share more later on. I hope everyone stayed warm and safe, but can get out and enjoy all this long-awaited snow, if you haven't already. 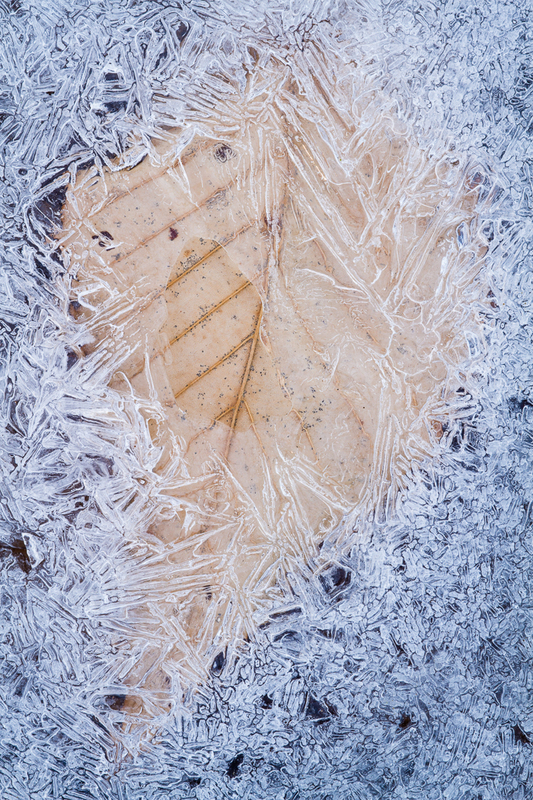 Beech (Fagus grandifolia) leaf surrounded by ice crystals in Rockefeller State Park Preserve, Sleepy Hollow, NY. Canon 7D, 180mm f/3.5L Macro Lens, ISO 100, f/16, 0.4 seconds.